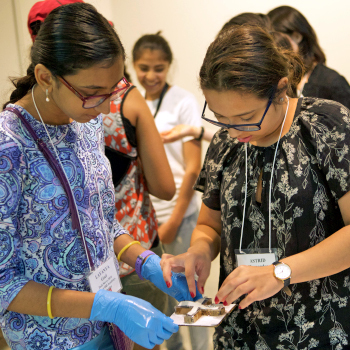 A group of middle school girls saw firsthand how science and technology are changing the world during a hands-on workshop hosted by the Harvard John A. Paulson School of Engineering and Applied Sciences (SEAS). The girls, participants in the Tech Savvy summer program, learned about robotics and 3D printing during a day of interactive lessons in the basement of Northwest Hall on July 26. Colette Abah, a research fellow in the lab of Conor Walsh, John L. Loeb Associate Professor of Engineering and Applied Sciences, explained how soft robots, made from flexible materials, can perform certain tasks that traditional, rigid robots cannot, such as search and rescue operations in dangerous environments. She described how researchers study biological processes, like the movements of an octopus, when developing soft robots. Abah led the students as they created miniature soft robotic grippers. The girls carefully constructed molds for their grippers using cardboard, string, and acetate. Once the molds were ready, they poured in liquefied rubber and then heated their devices in an oven to create malleable, cross-shaped grippers. The hardest part of making the soft robotic gripper was tracing and cutting around the intricate template, said Elizabeth Kudinova, 12, a seventh-grader at Boston’s St. Columbkille School. Students also learned about the computer science side of robotics by trying their hands at programming the Root robot, developed by the Wyss Institute for Biologically Inspired Engineering. Using a simple, image-based language, students programmed the small robot to roll across a white board and draw with a colored marker. Alana Tow, 13, an eighth-grader at Pollard Middle School in Needham, Mass., enjoyed the challenge of programming the robot to trace the letters of her name. In addition to hands-on robotics lessons, the students also explored the possibilities of 3D printing by designing personalized key chains using Tinkercad, a web-based Computer-Aided Design (CAD) program. They watched, wide-eyed, as the 3D printer created a pattern with colorful plastic. Nicole Black, graduate research fellow in the lab of Jennifer A. Lewis, Hansjorg Wyss Professor of Biologically Inspired Engineering, taught the students the basics of CAD. She talked about the many advantages of 3D printing, which can enable the production of cost-effective prototypes, but also the downsides and limitations of the new technology. Harvard was one site during the weeklong Tech Savvy program, which featured workshops hosted by several universities in the Boston area. At each university, the girls learned about innovations in different areas of science and technology, from mobile app development to bridge design. The goal of the annual program is to fuel girls’ interests in STEM (science, technology, engineering, and math).